The NCWorks Career Center – located at 845 Church Street N. – opened in September 2015. It replaced the old Employment Security Commission on Kannapolis Highway (see January 2016 issue). 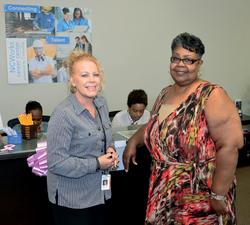 Operating under the umbrella of the North Carolina Department of Commerce Division of Workforce Solutions – and in partnership with the Centralina Workforce Development Board (WDB) – the Career Center aids job-seeking individuals in finding employment most closely related to their skill set. NCWorks Career Centers operate solely on grants from the Department of Labor’s (DOL) Veterans’ Employment & Training Service (VETS). The Jobs for Veterans State Grants (JVSG) program provides federal funding to agencies like NCWorks to pay for qualified staff. Funding for North Carolina’s agencies is based on a ratio using the number of veterans seeking employment here in comparison to the number of veterans seeking employment in all U.S. states. A vital segment of job-seekers is made up of our military veterans – vital because they’ve, in many cases, gone directly from high school into the military, dedicated years to protecting our country and often come home with no real direction. “Our target age is 18 to 24. The Department of Labor has determined they’ve gone straight from high school into the service,” Frankie Morton says. She’s a specialist with the Disabled Veterans Outreach Program (DVOP) for Cabarrus and Stanly County’s NCWorks Career Center. A U.S. Army “lifer,” Morton retired from the military in 2005. In the administrative branch of the Army, she was also stationed in Alaska, jumped out of planes and spent her last assignment at the Pentagon. But she wanted to be close to her aging parents and was fortunate to go straight to work for the Department of Commerce. Note, Morton says ‘can.’ That’s because Congress passed the Workforce and Innovation Opportunity Act in 2014. What it basically did was re-draw the boundaries of who is considered a veteran with significant barriers, as well as what Morton’s role is. “Before, the program allowed veterans to have that sit-down chat. Now, only those with barriers can talk to Frankie,” Denise Clawson, Concord’s NCWorks Career Center assistant manager, says. “Before 2014, any vet that walked through the door, I could see them. Congress has kind of changed the rules,” Morton adds. Then there are veterans that may need support with Post-traumatic Stress Disorder. “I cannot openly ask them, but if they voluntarily disclose that information, I would find out if they are being treated for PTSD. If not, I would then provide them resources and information on how to apply for help, or get themselves to a local VA or emergency hotline if it’s even more serious,” Morton explains. “When someone walks in, one of the first questions we ask is, ‘Are you a veteran?’ Then we give them a form to fill out – an assessment,” Clawson adds. While those veterans with significant barriers work directly with Morton, those considered non-barrier are helped by staffers like Clawson and they participate in workshops. 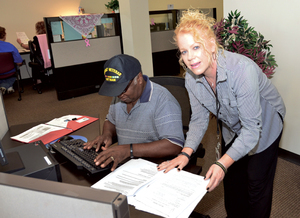 “We have two different kinds of vet reps in our agency…local veterans’ employment representatives (LVER) cover employment, outreach, job fairs…they’re advocates of vets. They’re on the road most of the time,” Morton says. NCWorks Career Center services are no-cost to veterans and include “career assessments; access to training opportunities, job fairs and workshops; job interview preparation; resumé and cover letter assistance; assistance with NCWorks Online; access to computers and free Internet service; and help applying for federal employment and training programs in which veterans receive priority of service,” according to its website. Morton’s position guiding those with significant barriers targets “help in developing an employability plan and goals; coaching in individual and group settings; and referrals to supportive services, including vocational rehabilitation, transportation, elder care, food and nutrition services, and non-profit organizations that address homelessness,” the website adds. “And a lot of people don’t know that we have an apprenticeship program,” Morton adds. combined with on-the-job training. These are paying positions with wage increases as they move forward in the program. “Apprentices work as they complete their classes; their work schedule will be determined by their respective employers, ncworks.gov says. “When they graduate, apprentices will receive a Certificate of Completion and will have earned the highly skilled ‘journey worker’ designation. The program can last one to five years, depending on the occupation. In addition, all job openings posted on NCWorks are accessible to veterans only, for 24 hours prior to the general public seeing them. Businesses looking to hire may specifically search for a veteran as well.